Mount Bromo Semeru Trekking Tour Packages 5 Days, are the combination adventure's tour of bromo tour packages option and semeru summit trekking tour, This tour packages is one of favorite's choice of mountain trekking tour package, because the distance of Mount Semeru and Mount Bromo is not too far away, so you can explore the phenomena of mountain which lacated in "Bromo Tengger Semeru National Park". After having breakfast you will start hikking to Ranu Kumbolo lake by 4 hours trek. Ranu kumbolo is the beautiful lake and very natural place for break. Wake up in the dark night at 00.00, trek to Mt Mahameru with duration 5 hours hard trekking. You have to be careful due the landslide common happen in these area, so make sure that you have a strong torch to light your path. The route to the summit quite straightforward, in the sandy loose ground will again test your stamina. After breakfast trekking down to kumbolo lake to enjoy ranu kumbolo and stay one night (camping). After breakfast enjoy the kumbolo lake sunrise and relax as your please until finish and satisfied. then trekking back to ranu pane using different route via mount ayek-ayek. Wake you up at 03.00 AM to get preparing to enjoy Bromo Sunrise, then start visiting by Mount Bromo Jeep 03:30 AM from your hotel to the parking lot then, take walking for 15 minutes to the view point. After get the view point, enjoy the Sunrise, Mount Bromo view and until satisfied. 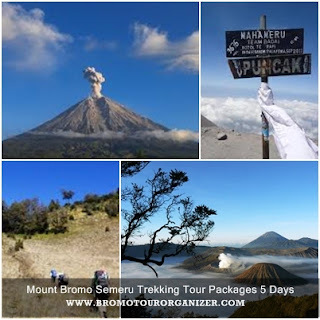 Mount Bromo Semeru Trekking Tour packages 5 days are finish the tour. Before you start Mount Semeru hiking tour, You must prepare the medical check (health note) from your doctor, If you can not prepare the medical check note, you can find it around Surabaya or Malang, you can also suggested to use Trekking Pole, Gass Mask and Personal Medicine. Trekking time to Semeru Summit is between Mei – December month, In rainy season will be closed the climbing activity due to the landslide sometime occured make the government notify for climbing tour. You can contact us For more detail information about Mount Bromo Semeru Trekking Tour Packages 5 Days price, accommodation and trekking facility.